with bulbous body and wide mouth, the short neck rising to a flat everted rim and the rounded base supported on three small pointed feet, covered inside and out with a pale lavender blue glaze characteristically thinning around the rim and sides to reveal the buff ware underneath and gathering attractively in a thicker band along the top of the rim, the tips of the feet and small areas of the base left unglazed revealing the gray stoneware body burnt reddish-brown in the firing. A blue-glazed Junyao censer of similar form is illustrated by Ayers in The Baur Collection: Chinese Ceramics, Vol. I, Geneva, 1968, no. A38. Another similar censer from the Brundage Collection is illustrated by Singer in the catalogue of the China Institute in America exhibition entitled Early Chinese Miniatures, New York, 1977, no. 206. 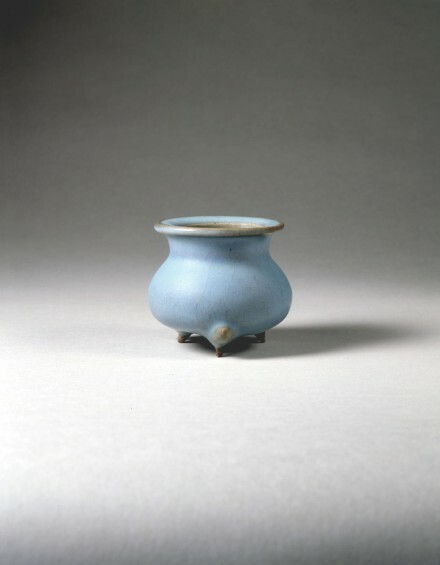 Compare also the blue-glazed Junyao tripod censer of very similar form and slightly larger size illustrated in A Panorama of Ceramics in the Collection of the National Palace Museum: Chün Ware, Taipei, 1999, no. 63, pp. 162-163.